← Happy Birthday Republika Srpska! The Georgian President Mikhail Saakashvili is in Washington DC these days, meeting with President Obama at the White House on Monday, talking yesterday at the World Bank, and tomorrow at Georgetown which I plan to attend. A funny thing happened in the post-talk remarks after the White House meeting. Speaking extemporaneously, President Obama made a Freudian slip, saying Russia before correcting himself quickly by saying Georgia. And one of the first things that I did was express my appreciation for the institution-building that’s been taking place in Russia — in Georgia — the importance of making sure that minorities are respected; the importance of a police and system of rule of law that is being observed — the kinds of institution-building that is going to make an enormous difference in the future of not just this generation of Georgians but future generations of Georgians. And so I want to express my appreciation for the work that’s been done in the past, but also anticipating fair and free elections here; the formal transfer of power that will be taking place in Georgia, which I think will solidify many of these reforms that have already taken place. What “formal transfer of power?” There is a forthcoming presidential election but its very likely that Saakashvili’s ruling party will win it. Furthermore, under Georgia’s new constitution it is quite possible that Saakashvili will move from the role of President (where he is termed out) to the newly empowered position of Prime Minister. Magdalena Frichova Grono memorably described this as “pulling a Putin” in a Foreign Policy piece in 2010.Tom De Waal, in an excellent op ed in the Washington Post, cites this and other challenges posed by Georgia for the US. 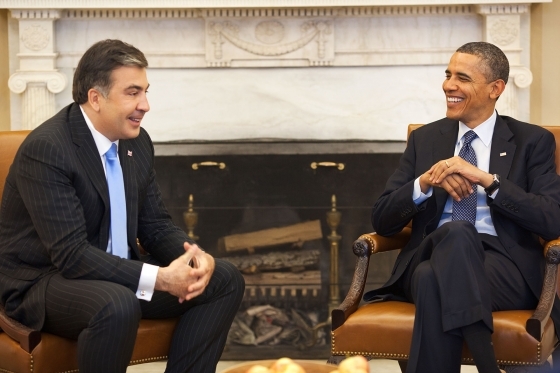 I would wager that the reason Russia slipped out of Obama’s mouth is that he had just made an argument in private that Georgia’s progress needs to be independent of Saakashvili’s political career. Institution building that will make a difference to a future generation of Georgians was the sentiment. Allied to this is the challenge to Saakashvili: “don’t be like Russia and Putin, and merely re-arrange the institutions of the state to further your own tenure in office. Distinguish yourself from Russia by formally transferring power to others, possibly even a coalition of opposition parties should they be able to win in an election contest (that is stacked against them at present).” Though, perhaps all this is projection and wishful thinking on my part! Freud, of course, is treated with great skepticism by many contemporary social scientists but one doesn’t need his whole schema to understand the workings, and biases, of human cognition, particularly the unconscious (Freud’s great discovery). Advances in neuroscience , most prominently the work of Antonio Damasio, and that in allied fields like cognitive linguistics (Lakoff) and cognitive psychology (Kahneman’s Thinking Fast and Slow) provide alternative schema to understand such ‘slips of the tongue.’ Note also how Georgia is interpreted within the prism of Obama’s core passions, namely “respect for minorities” (articulated before the whole cant about trade). For a consideration of Georgia’s progress but also problems, failings and challenges see Tom de Waal’s report Georgia’s Choices from June 2011 and the Chatham House report from March 2011 by Neil MacFarlane also. This entry was posted in Current affairs, Georgia, Obama, Presidency, Putin, Washington D.C. and tagged democracy, Freudian slip, neuropolitics, Putin, Saakashvili, White House. Bookmark the permalink.